Liverpool may sit top of the Premier League table, and be in with a good chance of getting to the last four of the UEFA Champions League, but there are still improvements to be made to the squad pieced together by Michael Edwards and Jurgen Klopp. The Reds lack genuine squad depth in certain areas of the pitch and, according to recent reports, Liverpool’s summer transfer plans revolve around addressing these gaps as opposed to complete overhauls like in previous years. The one glaring issue is just how over-reliant Klopp is on his front three. Roberto Firmino, Mohamed Salah and Sadio Mane are one of the most feared trios in world football, but, for starters, they can’t play every single game. The Liverpool manager’s options are limited in attack. Beyond his favoured front three, there’s very little else unless he wants to completely change the dynamic. With this in mind, our friends at Football Whispers have taken a look at five forwards who should be on Klopp’s summer wishlist. Rumoured to be a transfer target for Bayern Munich, Werner’s versatility makes him an ideal fit for Liverpool. He started life as a left winger for VfB Stuttgart before he shocked German football by making the move to RB Leipzig. It was there that he was unleashed as a forward and thrived as the main man. Since his move to the Red Bull Arena he’s averaged 0.6 goals per 90-minutes and that is over a sample size of almost 7,000 minutes in the Bundesliga. His arrival would allow Klopp to field him alongside Firmino, Salah and Mane in an interchangeable front four. Despite starting in an attacking two for the German outfit, he shares many playing similarities with the Liverpool No.10. 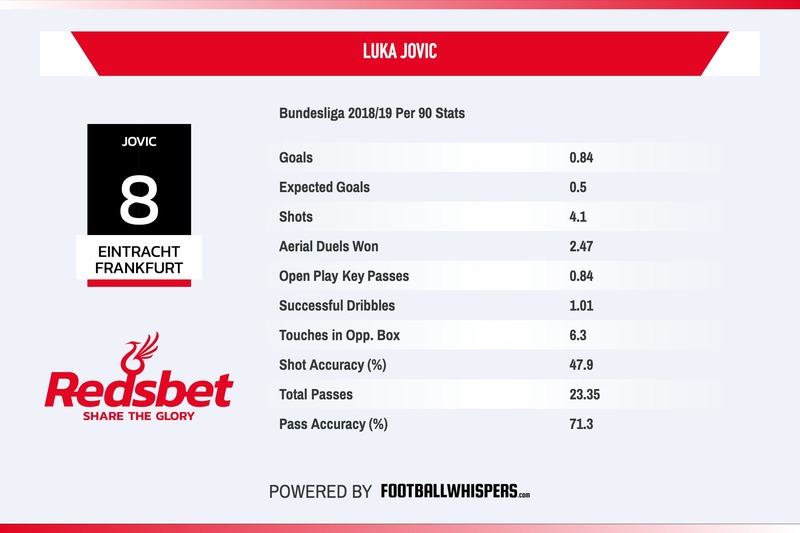 Seemingly the flavour of the month in the Bundesliga, Jovic would’ve been setting alerts off on Edwards’ laptop last season too. The on-loan Benfica starlet appeared in 929 minutes in the Bundesliga during the 2017/18 campaign yet managed eight goals with an expected goals per-90 average of 0.81. If he could extrapolate that over an entire season then he would be one of the best strikers in the world, despite being just 20 at the time. This season he’s appeared in over 1,500 minutes in the German top flight and his goals per-90 average is slightly up, coming in at 0.84. He’s shown himself to be not only a poacher but a complete forward capable of being a creative force. He could lead the line in a 4-2-3-1 system and perhaps also drop into the number 10 role, switching with Firmino throughout matches. He’s being courted by Real Madrid and Barcelona but if Klopp got his hands on him he could well be his next Robert Lewandowski. He may not get as much fanfare as his Eintracht Frankfurt strike partner, but Haller is also having an unforgettable season. The 24-year-old has 14 goals and nine assists in the Bundesliga this term, and he’s chipped in with another five strikes and three assists in the Europa league. The Frenchman would be more of a plan B option if he did join the Reds. No striker in Germany win more aerial duels on a per-90 basis (8.5). However, that may not be a bad thing. Unlike Jovic he’d not break the bank, and with Liverpool now not afraid to cross the ball into the penalty area, his aerial prowess could come in handy. Could he work as part of a 4-2-3-1? That would depend on how well he adapts to playing alongside Salah, Firmino and Mane. One thing to note is the fact he seems to do a good job alongside Jovic, Ante Rebic and Filip Kostic. There’s a bit of Luis Suarez about Gomez. His thirst to win cannot be quenched and there’s an edge that means you just know there’s never going to be a lost cause with him leading the line. The 22-year-old impressed during the 2017/18 campaign, netting 18 goals in LaLiga as well as adding four assists. This year, just like Celta Vigo, he’s struggled. The brutish forward still has nine goals in the Spanish top flight and he has bettered his assist tally with five, but he’s not been as effective without Iago Aspas alongside him in attack. Will Liverpool have a new Uruguayan centre-forward next season? 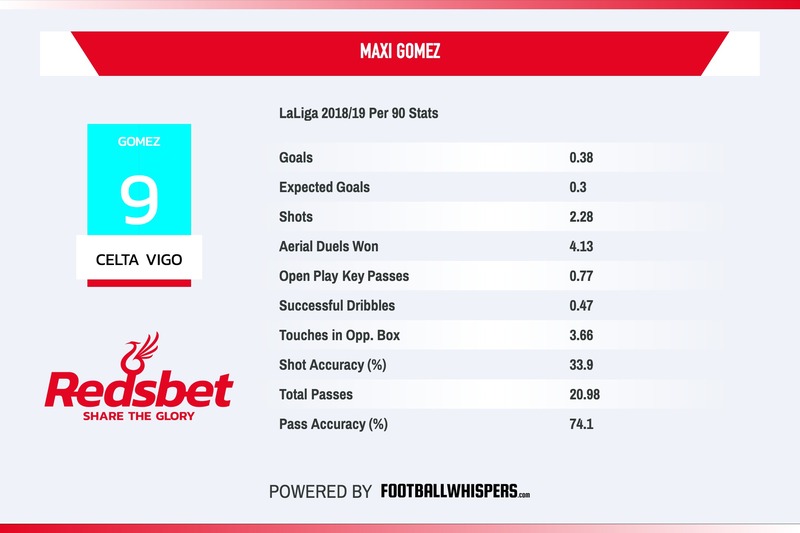 Its 3.50* for Gomez to sign! However, he’s still outperforming his expected goals average and his all-round play is improving. His rumoured release clause is believed to be in the region of £40million. It’s a fair chunk of change but he could well have the ideal profile for a Klopp striker. His potential just needs to be harnessed. This one is a bit of a left-field shout. Williams has linked with Liverpool in the past. Klopp was reportedly a big fan but an eye-watering release clause put him off. But a number of things could see the German tactician return for the Athletic Bilbao man. First off, the Reds now flex their financial muscle on a yearly basis. But, perhaps, more importantly, Williams is no longer a wonderkid primed to take the world by storm. It would be harsh to say he’s stagnating but he’s 25 this year and a move could kickstart his career. On top of that, Bilbao may want to cash in on him. He isn’t the most prolific forward but for context, Mane’s expected goals average this season is only 0.06 better. In terms of stats, he’s not too dissimilar to the Liverpool No.10 with the exception, of course, being goals scored. But his output could improve in a better team as it did with all three of the Liverpool forward line. In terms of profile, he ticks all of the boxes for the Reds. His versatility could see him appear once again on Klopp’s summer hit list. 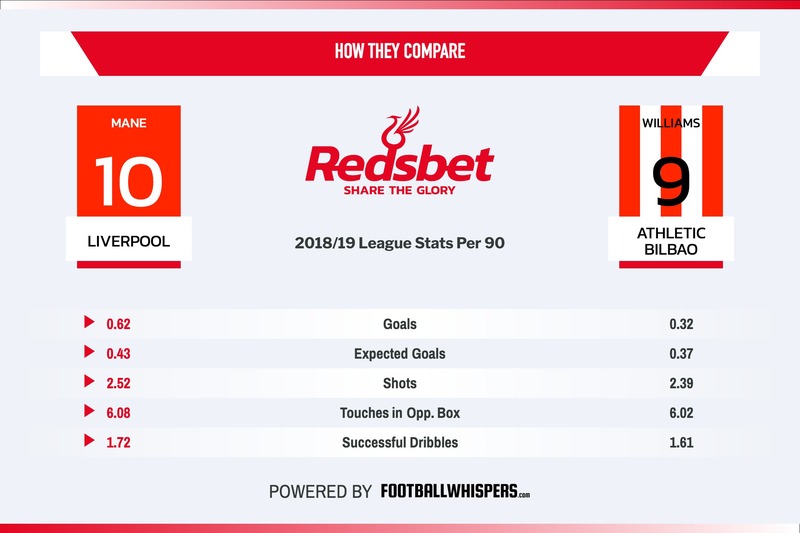 VIDEO: How Does Mane’s Hot Streak Compare To Other Liverpool Stars? At RedsBet, we are committed to giving back 50% of our net profits to fan-related causes and initiatives. If you are looking to bet on the match and you happen to lose we want you to be safe in the knowledge that your money is going to benefit someone in the LFC community. You can find out more information on this here and see examples of our ‘Giving Back’ and our partnerships here. We’re just getting started. Up The Reds.